DNA Face Matching has become one of the most popular ways to get immediate answers to DNA paternity and DNA relationship questions. If you’ve been wondering whether you or someone else could be related to someone and you’re not quite ready to invest in an office visit mouth swab or blood test, this is the best way to get accurate results. Who knows, you may have an open case from a clinic based service and you want to complete this test to pass time while you wait on your accredited results to complete. Facial Recognition comparisons for the purpose of paternity has been trusted and recommended by thousands of families. Families trust Face IT DNA Technology! Our laboratory is a global company that offers premier results with complete confidentiality. We’re also trusted by the BBB. With advancements in facial recognition technology our Basic Package allows you to compare the father’s face to the child’s face without having any computer experience. Simply use the upload file button on this page, answer a few questions and submit the photos. When we compare the pictures of 2 different individuals, we can provide a written break down of facial and hereditary characteristics that are similar and those that differ. There’s no way of predicting with 100% accuracy, but our clients find it comforting to have a skilled second opinion on their photos. That’s what we provide, and we do it well. Comparing one person’s face to another is a similar concept to using your face to open an office door or unlock your mobile phone. We use certain facial points of one person and we compare those points to the other person. It’s extremely convenient due to the fact it can be done from your home by using your mobile phone or computer device to upload your pictures, therefore you get same-day results. You don’t come into the office to do Face DNA testing. This type of test is done right from the privacy of your own home. 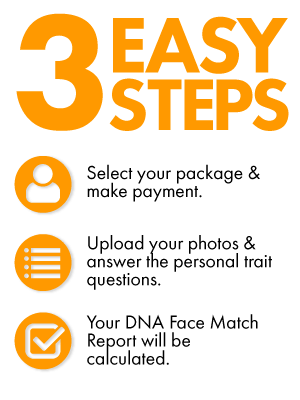 Use the Basic Package submission form on this page to Discover your Facial Similarities and Differences today!